I most often recommend learning to manage your emotions by practicing deep breathing and dialoguing with your inner child, so that you deepen your relationship with yourself, and strengthen your inner spiritual core. Learning how to heal your wounds and discipline your ego is key to deep, long-term change and self-mastery. However, there are times when emotions can be quite intense, and holding your neurovascular points on your head can be helpful energy medicine. After all, your body is your inner child, so this tool can serve as an additional support. To use this tool, you can hold the main neurovascular points on your forehead, while you focus into the issue of the emotional stress and the emotion. Breathe deeply, and hold as long as you need for the emotion to subside and calm to return. This may be for several minutes. If your arms get tired, you can rest your arms on a table in front of you and lean onto your hand, or lie down and put pillows under your arms so that you remain relaxed. 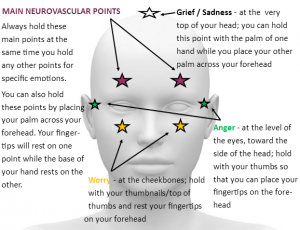 You can also hold the main neurovascular points at the same time that you hold the points for a specific emotion. At times, you may find that you are feeling a combination of several emotions, such as anger and sadness. In that case, intuitively follow the energy of your emotions and move to the relevant points, but do give your body enough time on the each point to receive the support. This can be a great tool to help your young child – hold the points for them. 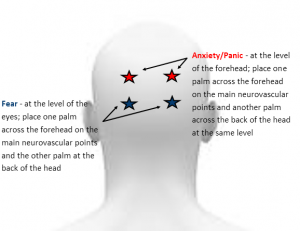 An alternative to holding the worry points is to simply place your hands over your eyes so that the heel of your hand is resting on the worry points and your fingers are resting on the main neurovascular points.